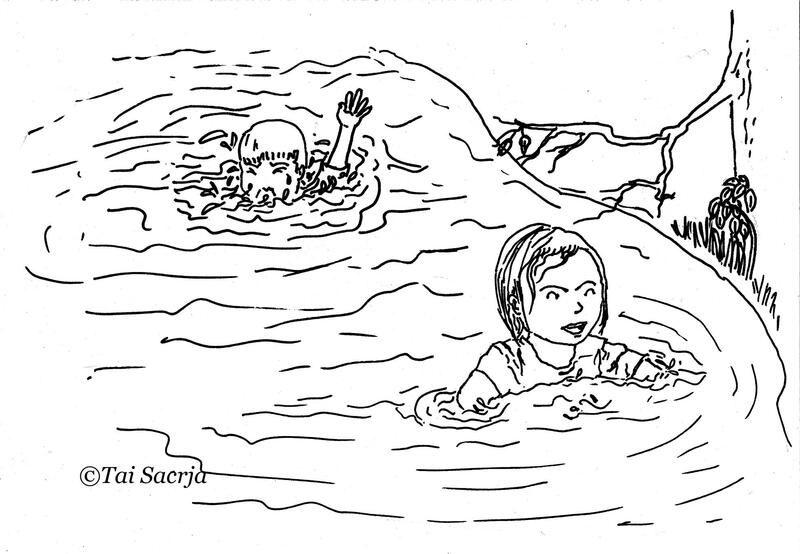 According to the Thai Ministry of Health, over 1,300 children drown each year in Thailand; and according to the WHO drowning is an even bigger problem in many other Southeast Asian countries, e.g., in Vietnam over 3,000 children drown each year. 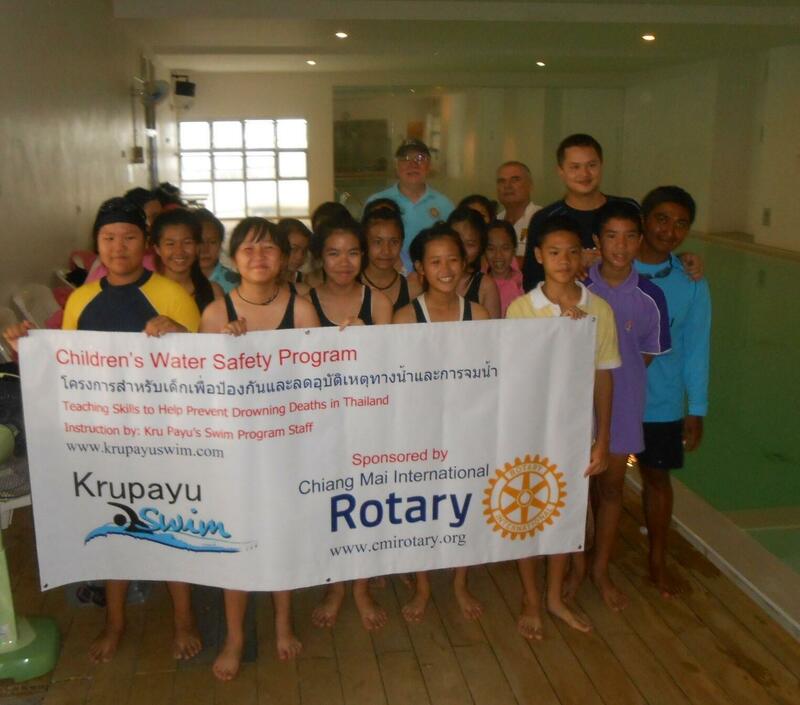 Last year, the Chiang Mai International Rotary Club (CMIRC) decided to address this problem as one of its ongoing projects under the club’s principal service focus: “Protecting Children.” The CMIRC Children’s Water Safety and Drowning Prevention Committee set the goal of developing a program to reduce children’s drowning deaths first in Chiang Mai and in the future all of Thailand. To accomplish this goal, we set out to identify instructors, develop a curriculum, plan an ideal instructional schedule, locate the most appropriate participants, build partnerships with municipal officials working with poor children, and explore funding strategies. Over the course of the year CMIRC has invested 85,000 Baht in four pilot programs and based on our experiences teaching over 140 poor children water safety, we now feel ready to move forward with full implementation of the CMIRC Children’s Water Safety and Drowning Prevention Program in Chiang Mai beginning in August of 2016. We plan to develop a prototype or model program that will protect children first in all of Chiang Mai, and, in the future, the entire country of Thailand using the Rotary network to spread the word and identify program locations and staff nationwide. Each of our pilot programs focused on teaching children basic survival skills in the water. Our target audience was non-swimmers whose families did not have the means to pay for private swim lessons. The Chiang Mai International Rotary Club provided all of the equipment that the children needed for these programs, including swimming suits, caps, towels, goggles, etc. We also paid the swimming pool fees (greatly reduced for our program) and the swimming instructors’ fees (greatly reduced for our program). We were very fortunate to identify a local, nationally known swim program: Kru Payu’s Swim. Kru Payu has over ten-year’s experience teaching children with disabilities and children whose families do not have the means to pay for private swim instruction. He has also studied and trained other instructors using an internationally recognized Australian drowning prevention program. Over our pilot year, we experimented using differing schedules, locations, and age ranges for each of the pilot programs in attempt to learn the most efficient way to “drown-proof” children. Identify instructors: Kru Payu Swim based in Chiang Mai has over 20 full and part-time instructors. We identified five instructors who wanted to do work with poor children and who were very interested in our goal of reducing drowning deaths in Thailand. Kru Payu worked with them to adapt water safety and drowning prevention techniques to best address the needs of our Thai children. Develop a curriculum: Over four programs we learned many lessons, but the basic curriculum in the international program worked well. We did decide that our program sessions needed to be lengthened from 10, one-hour sessions to 10, 90-minute sessions, allowing time for 30 minutes of pool-side instruction before entering the water. We also learned that 5 instructors for 35-40 children aged 8 to 12 was sufficient. Ideal instructional schedule: after trying 4 different schedules, we decided that 90-minute sessions three times a week for three weeks and one 90-minute, final evaluation session in the fourth week was ideal. Locate the most appropriate participants: after much consideration we decided that public school 3rd graders (8-year old children) would be our target audience. Build partnerships with municipal officials working with poor children: we have had great success working with public school authorities and the Chiang Mai Mayor’s Office, so we will have access to the poorest students and the city will provide transportation to our pool. Beginning in August we will offer every public school third-grade class in the eleven public schools the opportunity to participate in our program. Explore funding needs and strategies: based on our pilot-year experiences, we know that we can offer our Children’s Water Safety and Drowning Prevention Program to an entire third-grade class for 18,000 Baht (around US$500). The CMIRC has already committed to funding four of the eleven schools and we are actively seeking funds for the additional seven schools. We are confident we will succeed for the coming year, but what we really need are on-going very long-term commitments so that after 4 years we can guarantee that for the foreseeable future every Chiang Mai public elementary school graduate has had water safety and drown proofing instruction. The entire 11-school Chiang Mai program could be funded for 200,000 Baht per year (around US$ 5,500). While we hope to greatly expand the local CMIRC water safety program and to work with many more children throughout the entire Chiang Mai Province, our committee’s long-term goal is to develop a model or models of instruction that can be taught to swim instructors in all regions of Thailand. We hope to work with Rotary Clubs and other service clubs to identify and sponsor swim instructors and swim programs that could provide water safety instruction for poor children, teach the teacher programs. We are planning to raise funds for the development of a course focused on “teaching children water safety and water survival.” We would hope one day to offer this course here in Chiang Mai to those swim instructors nationwide, who have demonstrated their desire to help poor children and who have the support of their local Rotary Club or other recognized service organizations to develop programs such as ours in their communities. Thank you for your supprt.